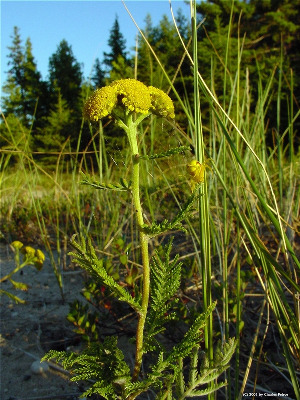 T. huronense of Michigan Flora. Thrives on fairly active sand dunes along the Great Lakes; relic (usually without flowers) on old well-stabilized dunes; on upper sandy or even cobble beaches, withstanding some wave action at times of high water; rarely in crevices of limestone. The species also occurs in Maine and the Maritime region of Canada, north to Newfoundland, as well as in the Hudson Bay area and on beaches of Lake Athabasca, and Alaska and the Pacific Northwest. Our plants are subsp. huronense (Nutt.) Breitung, often recognized as a species. The leaves are usually not conspicuously glandular-dotted, but are hairy and more finely divided than in T. vulgare. The heads run twice as large as in that species, but are fewer, usually 3–12 (–22) on a major stem, compared with 10–100 or more in T. vulgare. The aroma is similar. The rhizomes of T. bipinnatum may help in stabilizing sand dunes, although very large colonies of the plant are not seen. The species usually has very small rays (to 3.5 mm), while rays are absent in T. vulgare. MICHIGAN FLORA ONLINE. A. A. Reznicek, E. G. Voss, & B. S. Walters. February 2011. University of Michigan. Web. 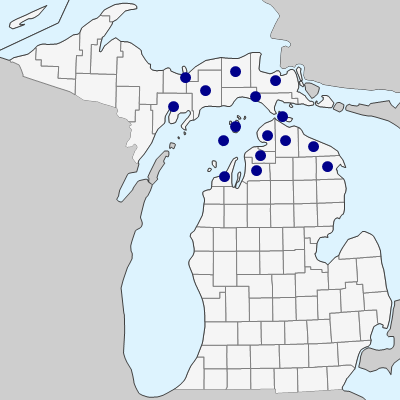 April 19, 2019. https://michiganflora.net/species.aspx?id=499.